The only uncertainty when it comes to my pre-theater meal at Central is should I order a burger with tuna, lamb, lobster, or beef? The fact that I haven’t written about Central before now is nothing more than a serious oversight. I’ve been a fan since the early days, when Chef Cedric Maupiller (now of Mintwood Place) ran the kitchen of this Michel Richard restaurant. Central (the emphasis is on the last syllable and not the first) is notable as a bistro that can be counted on for quality and consistency. I consider it a great go-to in my DC dining repertoire. What I like most about Central can be described in one word: CRISP. Crisp french fries. A burger with a crisp potato tuile for extra crunch. A salad with a crispy crouton. If a food is meant to be crispy, then I consider it a failure when it doesn’t deliver. If the crispy element is a surprise (i.e. the tuile), then I consider it a happy one. Central does crisp often, and it does it well. 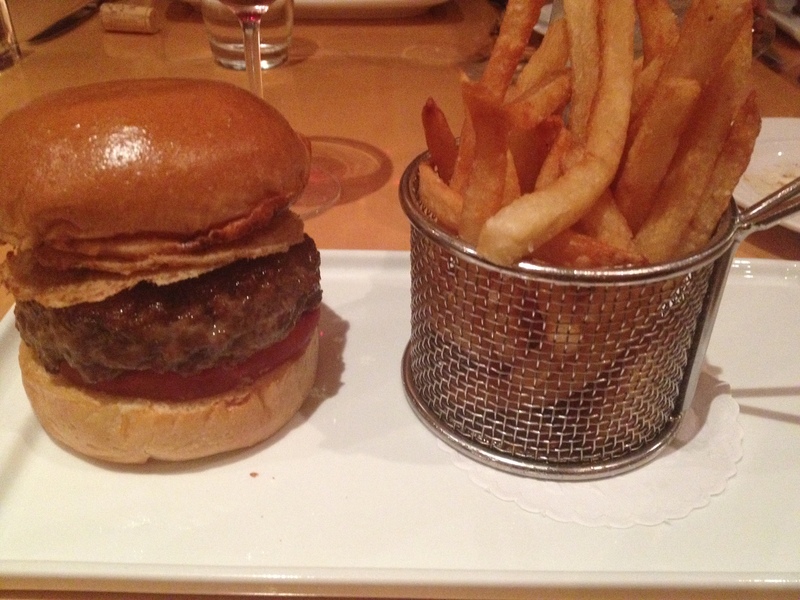 I am usually more of an adventurous diner, but after multiple visits to Central I have learned to succumb to the burger. (Although once I did veer off course and ordered the crispy fried chicken.) On this particular evening, the lamb burger is calling to me. 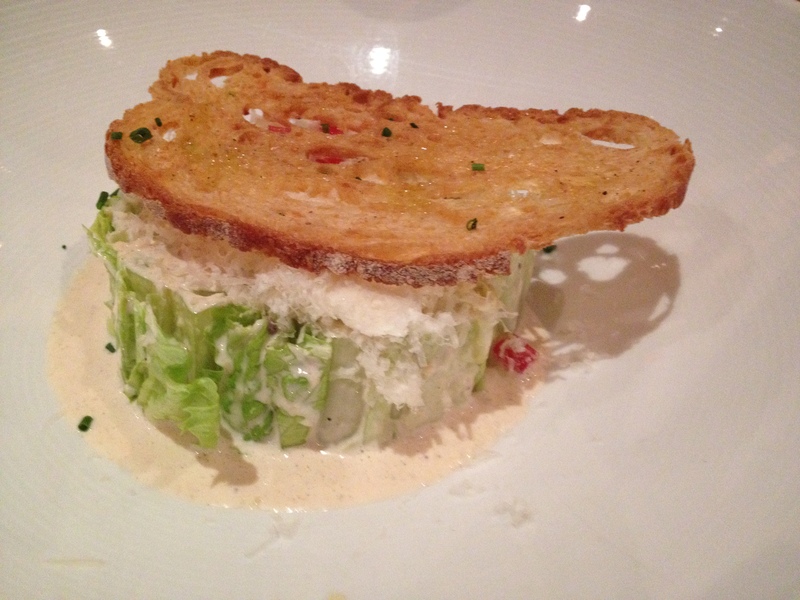 But first, a shared order of goat cheese Caesar salad, which is one of my favorite dishes in town. Part of the attraction is the crisp wedge of lettuce, generously coated with a creamy goat cheese dressing. A touch more dressing could result in disaster, but this is perfectly apportioned. There are multiple reasons for the success of Central’s lamb burger. The meat is juicy and well-seasoned. The buttery bun holds together, never giving in to the drippings of the succulent meat. But the potato tuile is the distinguishing factor, adding texture and a satisfying crunch. If this isn’t one of the best ways to accentuate a burger, then I don’t know what is. Hot, perfectly salted fries are an absolute necessity as an accompaniment. Central has been a hit for some time, playing to sold out audiences with its crisp cuisine. “If/Then” is headed for Broadway in the Spring. There are some kinks in the show still to be worked out, as Peter Marks of The Washington Post points out in his review. If the musical can be retooled to make it a little more crisp , then it has potential for a long-lasting run.